Copenhagenize.com - Bicycle Urbanism by Design: Is Urban Mobility A Human Right? Is Urban Mobility A Human Right? The further development of Bubble Wrap Society seems to be in full swing all over the world. The buzz about the bicycle over the past 18 months or so has seemingly given rise to increased buzz about bubble-wrapping the vulnerable traffic users like pedestrians and cyclists. It's a kind of counter-attack, not unlike the Audi advert we blogged about recently. Tom Vanderbilt, author of Traffic and the blog How We Drive has a telling article in Slate about the current cause célèbre among motorists and authorities - cracking down on jaywalking. In his In Defence of Jaywalking Tom covers the new hype about these foolish souls who dare to inconvienence motorists by crossing streets where they're 'not supposed to' are under fire. Which brings us to the question. 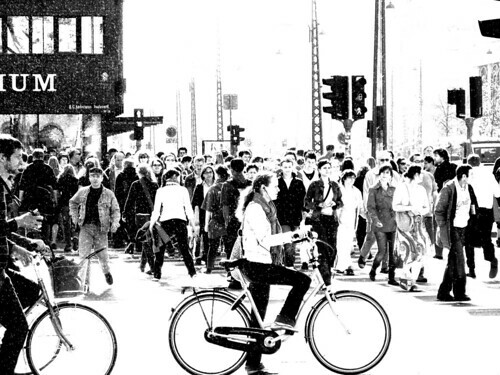 Is Urban Mobility a basic human right? Do we not have the right to move about the urban landscape as we see fit? It has been so for most of human history, after all. If the answer is yes to that question, then surely allowing all citizens to exercise freedom of mobility involves making the urban landscape safe. Which means restricting the movements of the dangerous, life-threatening player in town - automobile traffic - instead of the movements of pedestrians and, in some ways, cyclists. Should pedestrians and cyclists have the priority in cities and towns for choosing sustainable transport forms? Should infrastructure for cyclists of all ages not be a priority in urban planning? Is Safe Urban Mobility a human right?